Rainbow Peace Long Banner NEW! Imagine a world of peace and tranquility! This vertical Rainbow Peace Banner creates a calming atmosphere as it welcomes peace in 7 different languages. 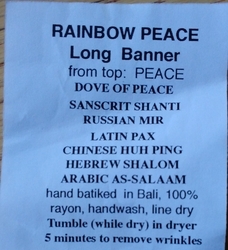 The Rainbow Peace Banner includes: English “peace"; Hindi "shanti"; Russian "mir"; Latin "pax"; Chinese "huh ping"; Hebrew “shalom"; and, Arabic “as-salaam". Measuring approx. 15” wide x 58” long, this Rainbow Peace Banner has a top sleeve pocket for hanging on a wall or can be used vertically on a door. 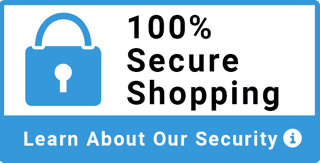 Give the gift of peace to your favorite friends and co-workers! Care instructions... The design is Rayon handmade Batik produced by an expert Balinese artisan. The banner comes folded and any wrinkles can be removed with a delicate/cool setting iron. It is hand washable and line/hang drying is recommended.